Abby Wolfe’s journey is just beginning. After a chance illness of one of the 2017 Songhubs participants, Abby was invited to fill to spend the day writing. While there, she met two of New Zealand’s top producers Josh Fountain and Djeisan Suskov, and immediately hit it off. The trio have now spent countless hours in the studio, fine-tuning Abby’s sound, placing her firmly in the pop realm. With three single releases and one feature under her belt. Abby has gone from strength to strength over the last 18 months. She co-wrote and featured on Chores’ biggest single 'Surrender' which was released in early 2018, and jumped on the bill performing with the duo at Homegrown 2018 & Christchurch O-Week. Her singles have been added to playlists on NZ radio stations such as ZM, The Hits & MoreFM, and her latest single Win You Over was added to Beats 1 getting airplay in the US & UK. Abby’s most successful release Lonely In Company saw over 300k streams in four weeks, international blog attention & radio support, also resulted in an ad campaign placement to promote Apple Music. 2019 is all about growth for Abby Wolfe, and that starts with great songs. 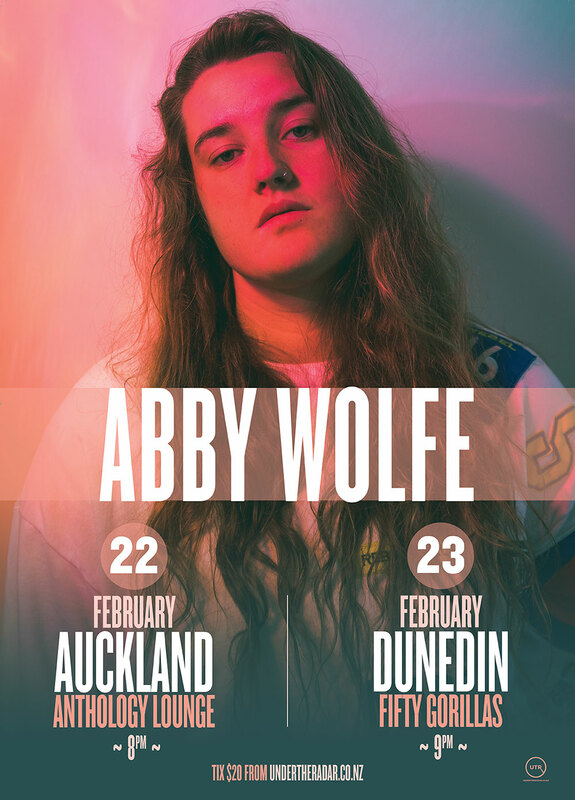 Abby is incredibly pumped to bring her full band live show to Auckland & Dunedin this summer.